One of the organizing myths I’ve talked about in the past is that it’s too expensive to buy pretty organizing containers. 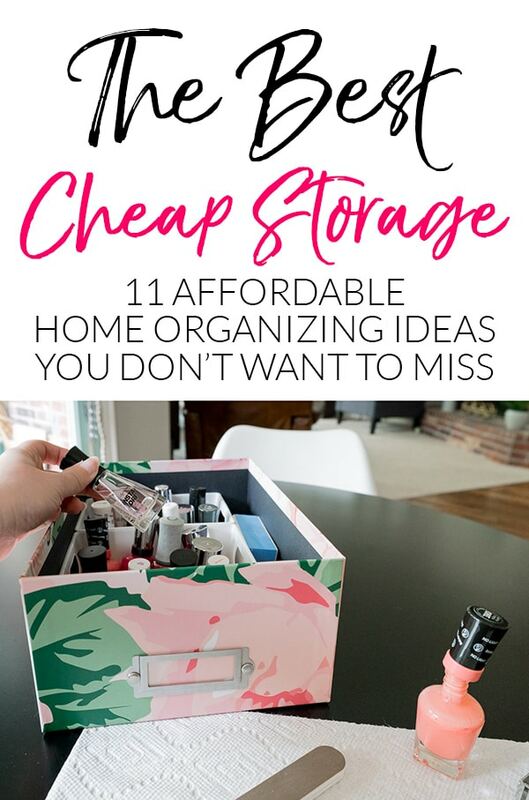 No doubt that CAN be true, but some of my favorite organizing boxes are often on sale for $2 each! Have you ever seen the photo boxes at Michael’s? Other stores carry them as well, but I’ve never seen them for the same affordable prices. They’re often on sale for either 4, 5, or 6 boxes for $10…meaning the price ranges from $1.66 to $2.50/box depending on the offer. I think the normal price is $4.99, so if possible, wait for them to drop to at least $2.50. PS: This is NOT sponsored, just where I’ve found the best deal. I’m not even adding a link to Amazon because they are $7-$10 for the same thing. 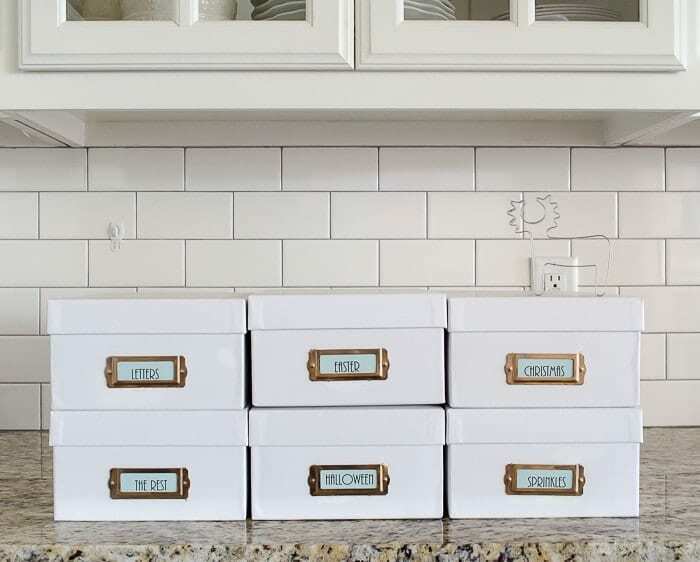 Here are 11 different ways that you can use these cheap storage boxes to get your home organized! We have an abundance of playing cards, card games, and small dice games like Farkle. They are constantly falling off the shelf when we try to grab the bigger games. Not anymore – now they’re tucked inside one box! I love pretty note cards…and probably have enough to last a few years. But what can I say, I thrive when I have some options! A couple years ago, I finally went through all the office drawers and closet to gather all the notecards into one place and it’s been great. To make it even easier, I keep stamps and return address labels in the same box. Now I don’t have any excuses not to send a quick note to a friend! These boxes would be perfect in a kid’s room to store Lego bricks! I get a bit excited thinking about all the options – you could sort them by block size, by color, by set with the instruction books, etc. The same thing could be done with any small toys, from Hot Wheels to Barbies & their clothes/accessories. For smaller kids, you can use photos of what goes in each box on the outside to help them clean up without you. 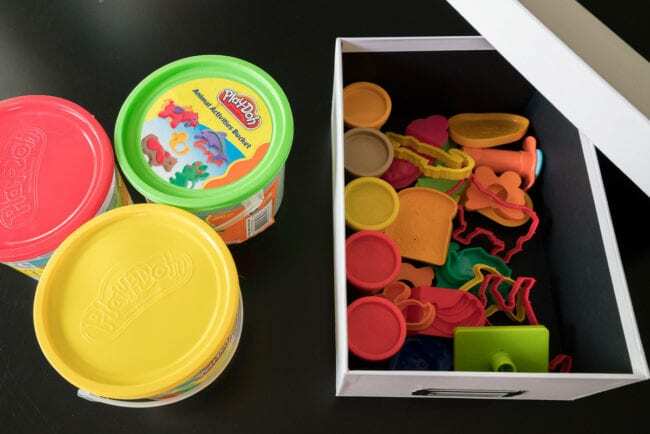 For us, the solution is perfect for the Play-Doh sets we have downstairs for our niece and nephews. From the outside, you’d never know there were colorful toys hidden inside! We recently updated our hallway storage closet organization and created a spot just for the Play-Doh box you saw above, along with boxes for votives and tea lights. It’s so nice having the small candles sorted by size and easy to find. I almost didn’t include this one because it’s the obvious intended use. But I also know I lot of people that have large boxes of printed photos, which can be overwhelming to tackle. To make it easier, I wanted to give you ideas for a few different ways to separate the giant stash into these manageable smaller boxes. First, designate one box (or two at the most) for your absolute favorites. Some people would say to only keep these, but I’m a sucker for old photos! Then, depending on your needs, create boxes for other categories. Some easy options are to separate by year, decade, or by event type (IE: Vacations, Birthday Parties, Christmas, Everyday Life). Even though I’m giving you the a-ok to keep more than just one box of your favorites, I’m also giving you permission to throw some photos away. If there are 10 shots that are almost exactly identical, you really don’t need every one. In the old days, I attempted to organize my cookie cutters by theme into gallon-sized Ziplock bags, and then those bags were shoved into a big reusable grocery bag. It took up a HUGE section of prime cabinet space and was just generally awkward. Now, I’ve got photo boxes designated for each major cookie holiday and for sprinkles and supplies. The boxes not only make it easier to find what I’m looking for, they are rectangle and stackable so can be stored anywhere. I have ours on the highest shelf in the pantry since I only use them a few times a year. If kitchen space is at a premium, you could tuck them in any closet or even under the bed. Why oh why did it take me so long to create a box for each of these? They’ve been spread out throughout the house for way too long. You can either keep the items in their original packaging or dump all the like items together into a box to make them easier to access. The boxes also work great for art supplies like glitter and craft paint! Ever spent 10 minutes trying to figure out where you put the tiny tube of super-glue? Or just basic Elmer’s glue? Or that Velcro you know you bought last year? Gather up all the different indoor adhesives into one photo box and you’ll save SO much time! 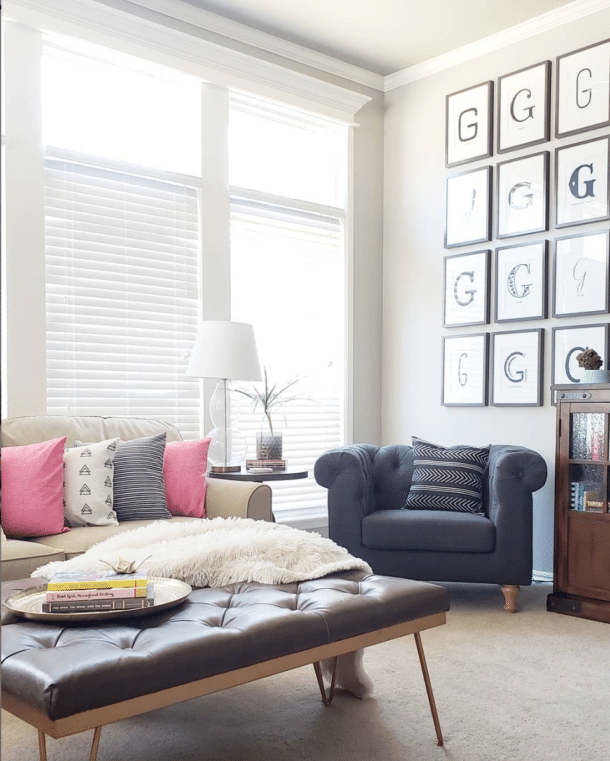 We have a few different styles of light bulbs required for different fixtures, and grouping them together makes the closet look way less cluttered. And we don’t have to worry about knocking individual packages of bulbs off the shelf. Ever buy the giant multi-pack of toothpaste, deodorant, or razors at Costco? Or stock up during a great sale? Photo boxes are perfect in the bathroom to corral all those loose items into cheap, stackable storage! 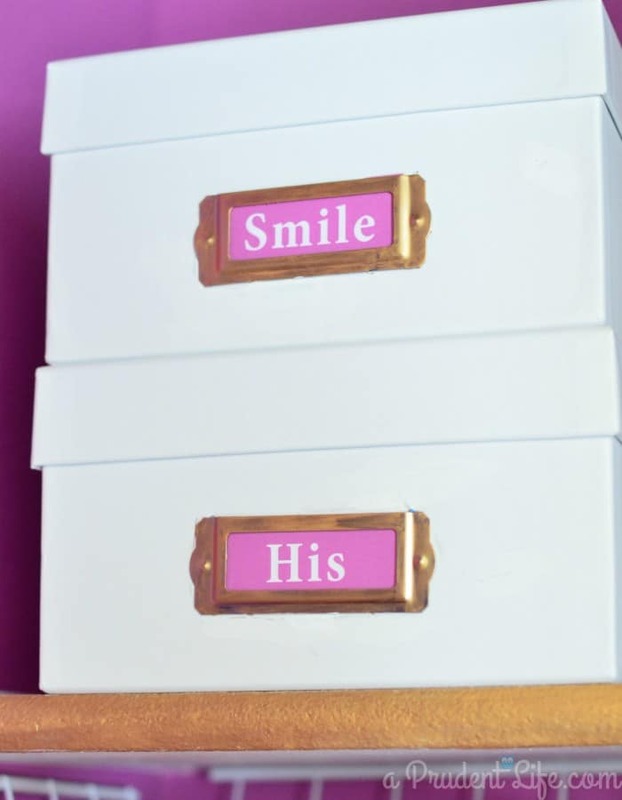 We have boxes for teeth, his, and hers in our bathroom closet. I don’t know about you, but I tend to do my nails somewhere other than the actual bathroom. 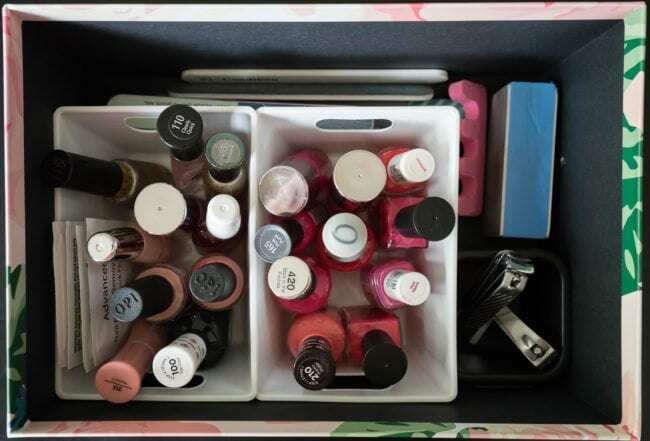 It took years of adulting, but I finally figured out it was easier to store all the nail care supplies in one bin I could carry around. 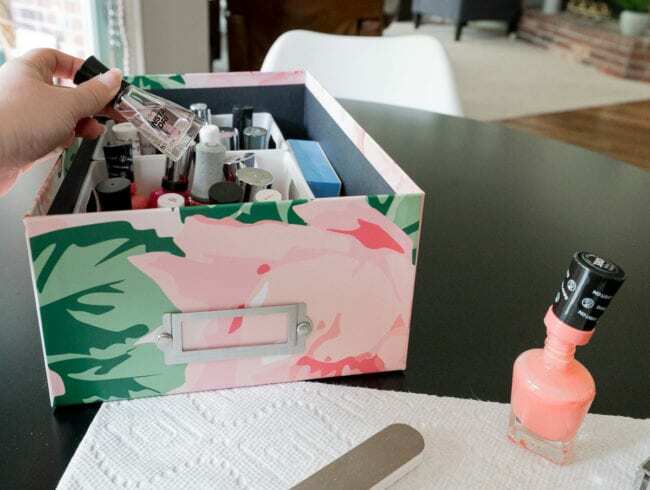 Clippers, files, nail polish, remover wipes, etc can all be stored in one photo box! It might be worth adding a couple of smaller containers within your photo box to keep things more organized. Sub-dividing larger boxes is one of my favorite organizing tricks! Who has a cluttered medicine cabinet or shelf? As with most things, it’s easier to KEEP medicine organized when there is a clear system in place that everyone can understand. Every household has different needs, but consider boxes for First Aid, Vitamins, Pain Killers, Stomach Issues, Prescriptions, Allergies, and/or Children’s medicine. 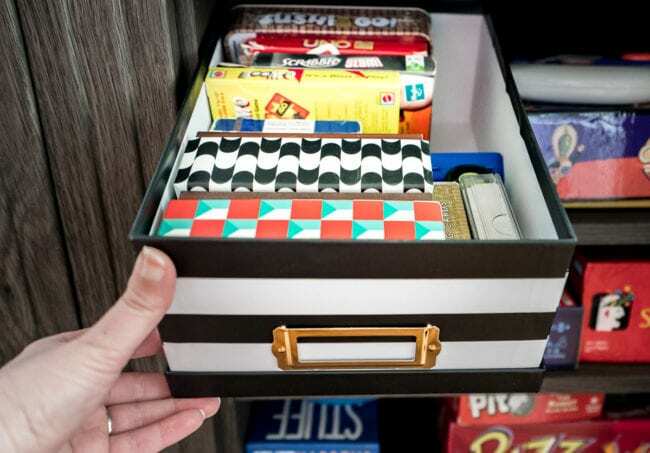 Is your mind turning with all the ways you can get organized with this one simple box? Those are 11 of my favorites, but the possibilities are pretty endless! When the 6 for $10 price rolls around, I always stock up because I know I’ll find new ways to use them. 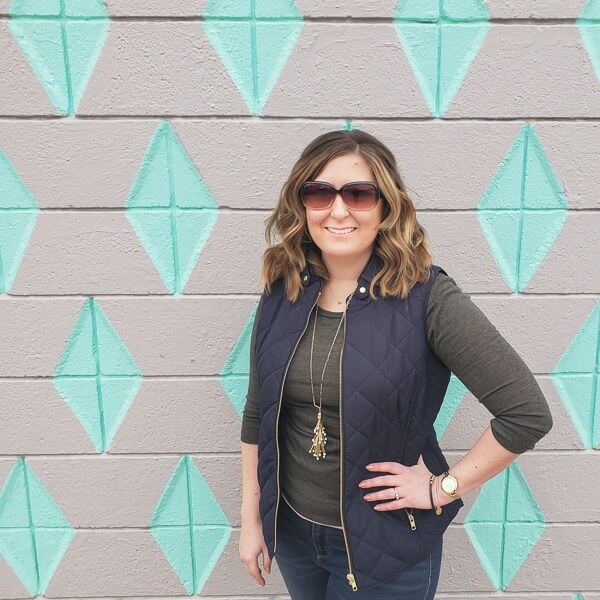 Fair warning – the patterns available change continuously, so if there is one you really love, don’t count on it being available again during the next sale. Next up, see the 11 ways to organize Christmas stuff in photo boxes! What other ideas do you have that I didn’t mention? Add them in the comments below! This is such a great idea for all those little, pesky, but essential items in our home that make an area looks cluttered or get lost easily… I usually try to find $1 baskets at the dollar stores, but they are not stackable. I especially like your nail care box! BTW, what is your favorite nail polish/color? Your nails always looks so pretty! Thanks for ALL your great tips, Melissa!! Nice ideas! I usually just throw most things in some drawers and that’s it, the photo boxes will be a great use! Hi Melissa, This came at the perfect time, since we are redoing our linen closet. 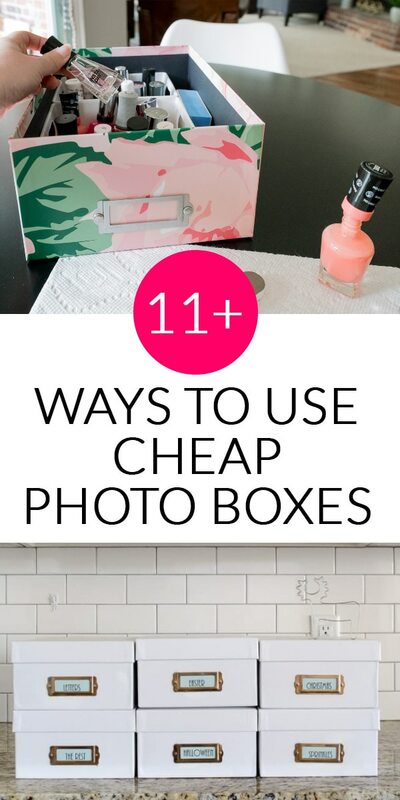 I’ve used photo boxes like these all over the house, too, but your post got my creative juices flowing. And I LOVE your beautifully organized closet. Thanks again! Thank you! I love it when timing works out like that! Extra buttons that come with clothes, needles and thread, scissors. My indoor gardening supplies: clippers, seeds, plant food, gloves, plant labels. Indoor tools: screw drivers, nails, screws, small hammer, tape measure, scissors, hardware for windows, tape. picture hanging, etc. Power cords, extension cords. And may favorite -receipts! Oh, and of course, recipes! My husband makes fun of my love for boxes. My grandfather had a box labled “string too short to save” lol! Oh my gosh, I need to make a box for buttons, threads, & little scissors ASAP. That’s a great idea! I love all your other ones too though. And I’m cracking up at your grandfather’s box label. Thanks for sharing! I can see many uses for these boxes! I have many of the things you listed in plastic shoe boxes but there are some things that just need to be out in a pretty box like the notecards!! I will be watching for the next sale on them to pick up some! Will consider photo boxes. Also saw some nice boxes seasonally at Dollar General, not exactly photo boxes but same concept. 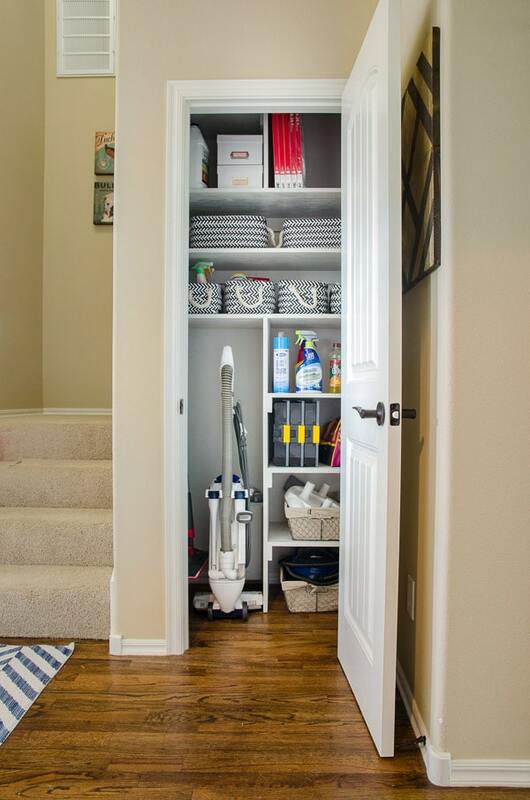 That is one organized and beautiful utility closet. Sigh. And room for a vacuum. How did I leave that out of my plans for this house? Live and learn. These are all awesome ideas. Thank you for sharing. Thanks, Melissa, for ALL your great ideas! One idea would be to have one in the car with coloring in books and pencils for young children . Very useful for when you’re stuck waiting at appointments. I just thought of another use for these boxes 🙂 hair accessories! That is a great idea! It would be really perfect for shared bathrooms with limited storage space because you could keep the box on a bookshelf in the bedroom. Dog leash & harness, doggie clean up baggies, doggie nail clippers, a bar mop for muddy paws when they come in the door, and doggie treats!! Stamps! Like those wooden art supplies. The paper, stickers, ink pads…. anything you use for stamping. I have an Etsy store and love to stamp the soaps I make and the little “thank you for buying from me,” and I don’t (yet!) have it nicely stored. Because I never used to do stamping things. Those are great ideas too, Jodi! I use the photo boxes for small candles, and fragrance refills for my wallflowers. I also use them for small seasonal bath decorations like my snowman soap dispenser & wallflower, in a seasonal box of course. It makes changing from winter to spring much quicker. I do also use for small craft paints & brushes, and small craft supplies. I will have to try some of your ideas! .. Blades (for the boc cutter, nukti tool, jigsaw, etc are in one bix..scissors are in another. Have about 10 of them so fzr all labelled so i can find things. Oh we need one for the box cutters and blades too. Great idea! Cannot wait to go to a Michael’s to get started using the Photo Boxes. It takes me at least an hour to drive to a Michael’s store, and I am going to check and see if they have their sales on their site online. Of course, I want to get a good deal because I am going to needs lots of these pretty boxes. Thank you for all your good ideas. I was having a bad night since my husband recently passed away, and this idea has cheered me up. Thanks again, Melissa. Hi Nancy, Sorry it has taken me so long to reply. I first read your note right before I went to sleep while we were on vacation last week and was touched beyond belief that the post was able to add a smile at the end of a hard day. I’m deeply passionate about helping people make their everyday life a bit easier and more beautiful with the hope that it will bring joy. But hearing this post cheered you up in one of the hardest seasons does things to my heart I can’t explain, and reminds me to squeeze my husband a little tighter. Thank YOU for sharing your appreciation, but I’ll use it as inspiration to keep going again and again. I love your idea of the boxes. I have used (and saved!!) boxes over the years. My mom liked old cigar boxes. Her father had tons of those, but my favorite one of hers was a photo box sized box from a department store which she labeled “things” We found it when she passed away. Empty of course, but so funny. Thank you for all your great ideas. I guess the first step is actually going thru our stashed items and weeding them out. I moved from a 2000 sf house to a 1100+ sf house and tried to keep it all. That was several years ago. I guess its time………. Thank you Shirley! I love cigar boxes as well – they designs are always so cool. My husband uses one at work for supplies on his desk! It’s too funny that your mom’s “things” box was empty! And I feel your pain, we have lots of stashed things to weed out as well. I’m working on our office right now. We went the opposite direction in square footage 5 years ago, which meant we had lots of extra space to fill up so haven’t done a great job only keeping what we need. But now the closets are full and we’ve learned our lesson to be more picky about what makes it into a closet in the first place. But we’ll both get everything decluttered one space at a time! I have to do this for the small games and cards! Thank you! You will LOVE it! I can’t remember if I showed it like this in the post, but we’ve figured out that keeping the lid off and nested under the box is working best. We can access the games quickly, and it let me add in a few that were too tall with the lid on. I keep all my smaller craft and quilting supplies in photo boxes. Everything is sorted “like kind” so it can be easily located. I preferred the pretty patterned boxes and stuck to a specific color palette to unify. My boxes include paints, stamps, adhesives (which includes all glues and fusible tapes), binding (which includes packaged binding, binding clips, etc), tapes (scotch tape, double sided, painters, carpet and duct tape). They stack nicely on wall shelves in my sewing room. And I keep the most often used on the lower shelves. I do this too! I have one to corral all of the misc. sizes of batteries in one place🙂 also, have one for birthday/greeting cards.